Please note, delivery is FREE with every order, and happens every Tuesday between the hours of 8:00 a.m. to 7:00 p.m. - generally 10:00 a.m. to noon. Please leave a cooler or insulated tote on your porch for receiving eggs if the temperature warm. Even doing so the night before will work. If you leave ice in the cooler, please rest a folded cloth towel on it so that the condensation doesn’t seep through to the egg carton. All members should leave their previous carton out on their porch to be switched out with a new one full of fresh eggs on delivery days. Memberships are available on a first come, first served basis. At certain times of the year, like the dead of winter, you may be asked to skip a turn on your egg membership if the hens’ laying drops considerably. Monthly and seasonal memberships are preferred so you can exchange/recycle your cartons each week, reducing waste and costs. Our hens lay at different frequencies throughout the year so these membership slots allow us to schedule the most consistent deliveries based on egg volume. If you want eggs delivered every other week, just let us know. Our super-fresh pastured eggs are $6.00 per share – equaling one dozen – plus a $.50 cent carton deposit with each membership renewal (monthly or seasonal). Still considerably less than you’d find pastured eggs at the grocery store or farmer’s market. 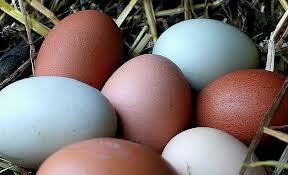 For comparison, organic pastured eggs found at New Seasons or Whole Foods are priced around $8.49 per dozen. And who knows exactly when they were laid? With DoodleDoo eggs you always get eggs laid fresh that very same week! Payment is due on the first delivery of each membership renewal. Feel free to leave payment out in a safe spot for pickup on delivery day. Also, if special arrangements need to be made, please get in touch. Get a free dozen with the referral of a new member! Delivery is offered free within a limited radius only. This is meant to be a ‘neighborhood’ service. Please inquire if you fit within this radius if you heard about us by word of mouth or online.